You’re sitting at your desk at 4:00 pm on a grey, rainy Thursday. You’re wasting time at your job until you can plausibly leave the office without getting in trouble, futzing around on YouTube (hopefully with headphones in this time, you don’t want another meeting with HR). Maybe you’re watching vegan recipe videos, or those unaccountably popular unboxing videos. Or maybe you’re watching a photogenic Australian family journaling about traveling the Gold Coast in a converted Econoline van. Yep, after delving into Marvel movies I dipped my toe into the even stranger world of #vanlife people, those attractive and social media-savvy wanderers who document their lives on the road and sell the dream that you, too, can give up on the daily grind and live a simple life. This desire resonated with me, as it’s something I try to pursue myself (the ideal of living a low-consumption, self-reliant life, not the van part). I watched videos about van conversions, about what a vegan family eats while travelling across Bali, about what kind of wardrobe you need for life in a van, and how you handle the basic hygienic necessities of life without running water, plumbing, or privacy. I know so much more than I ever wanted to about how you can turn a white panel van into something vaguely resembling a living space, and much less than I would like about the economic, social, and psychological impact of this lifestyle. It’s a fascinating trend, a peculiarly early-21st-century take on what seems to be an ancient human impulse to run away from your responsibilities and see the world. Vanlifers can be read in the tradition of Jack Kerouac, or as modern-day Huck Finns going up the Mississippi, or as a more positive, Law of Attraction version of off-the-grid doomsday preppers. Why would a bunch of Instagram-friendly Millennials up sticks and take to the road – is this the logical conclusion to the trend of “personal branding”? An understandable reaction to the current grim economic prospects for youth? A weird envy of the “freedom” of the poor? Even more, there’s much to unpack here in the odd gentrification of a low-consumption, low carbon footprint lifestyle, something which low-income people across the world model day in, day out without the benefit of a hashtag, and which has been encouraged by the majority of the world’s religious traditions for millennia. But to me, the most interesting aspect of #vanlife isn’t why are they doing this, or what they’re trying to sell us. I’d rather ask – considering that these accounts often have hundreds of thousands of followers – why are we watching? Why are we buying? YouTube is unique among social media platforms for its fusion of social media and entertainment. While anyone is free to post – indeed, if you have a Google account, you have a Youtube account – it’s also a major platform for music distribution, professional video content, and sadly a major mechanism for alt-right recruitment. It’s true that all forms of social media also function as entertainment, as most of us spend many more hours scrolling through Facebook, Twitter, or Instagram than we do posting, but Youtube’s particular position on this continuum heightens the problems raised by turning the self into a product. Psychoanalytic thinkers who’ve tackled the phenomenon of social media often miss this aspect, as well as the position of the viewer. For example, psychoanalyst and writer Christopher Bollas writes in Meaning and Melancholia: Life in the Age of Bewilderment of the “transmissive self”, a modern variety of self-objectification where the social media user metabolizes anxiety through becoming a cog in the machine, taking on the role of transmitter of bite-sized, basic information. 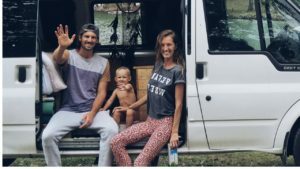 The van life vloggers certainly do this, consciously turning their lives – the stuff and substance of their days, their homes, their offsprings’ childhoods – into a product for our consumption. And they sell it openly, along with a whole raft of products you can use to jumpstart your simple van lifestyle. 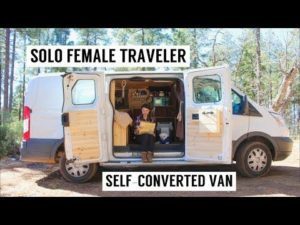 Not all are as bald as Jinti Fell, whose first video on her family’s transition to van life includes a raft of affiliate links, but all are desperately trying to monetize what turns out to be a financially difficult lifestyle. This is true enough, but what about the viewer? Jinti Fell’s family is only three people, one of whom is under 2, but her videos have hundreds of thousands of views. Sure, a lot of those are “hate watchers”, who watch ironically in order to make fun of the content, but at least some are watching sincerely. Aside from the basic entertainment value, why? …a lie about something we can all see. It is an attack on our capacity to know what is true, to apprehend reality outside the assertions of the autocracy. Trump lies openly and brazenly, and his supporters believe because they want to, colluding with their own deception because it meets their needs. Similarly, our #vanlife friends are openly hypocritical, espousing a simple life with few possessions on one hand and trying to get you to buy things with another. And we believe, colluding in our own deception, because we want to; because we want desperately to believe that another way of life is possible. This is a trap, though. As Bollas writes in Meaning and Melancholia, on the selfie, “What they reveal is not the self but an “other” in a solitary act of estranged intimacy” (63). Through the focus of the surface-level details, on the presentation, the self is emptied of subjectivity and we find ourselves knowing less about the people we’re watching – about ourselves – than we did before. Watch enough of these #vanlife videos, with their snapshots of beautiful people living theoretically beautiful lives, and you’ll begin to feel awfully empty. An artfully-composed Instagram feed is not the same thing as a real connection with another person, and no amount of conscious lifestyle curation can make up for real collective action to create more humane and sustainable lifestyles. The desire to live more simply, to focus less on material things and more on people, relationships, and experiences seems to me to be a good one. What’s more, it’s one within the grasp of just about everyone. All you have to do is a) not buy things and b) spend more time with people. If you are thinking of selling your possessions and moving into a van and documenting it on Youtube, maybe try that first. References: Bollas, Christopher. Meaning and Melancholia: Life in the Age of Bewilderment. Routledge, New York.